Space Frontier. Blast off into outer space in your space rocket. 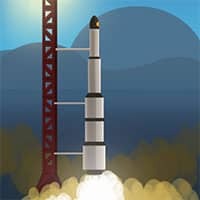 A cool physics rocket game where you have too carefully detach each part of the rocket as he fly into space. Your goal is to get it into the earth orbit. You’ll not have enough tech or gas to successfully complete the mission in your first few tries that is why you must earn in-game currency from successful launches and spend it to acquire new parts and styles. Enjoy and have fun in playing this free online game. Space Frontier is a free online action game on Round Games.